[PDF] The Handbook of Neoliberalism (Routledge International Handbooks) | Free eBooks Download - EBOOKEE! Description: Neoliberalism is easily one of the most powerful concepts to emerge within the social sciences in the last two decades, and the number of scholars who write about this dynamic and unfolding process of socio-spatial transformation is astonishing. Even more surprising though is that there has, until now, not been an attempt to provide a wide-ranging volume that engages with the multiple registers in which neoliberalism has evolved. 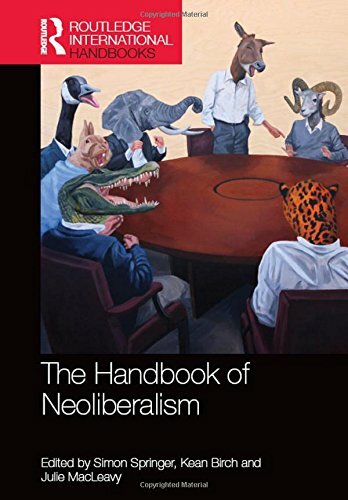 The Handbook of Neoliberalism seeks to offer a wide-ranging overview of the phenomenon of neoliberalism by examining a number of ways that it has been theorized, promoted, critiqued, and put into practice in a variety of geographical locations and institutional frameworks. With contributions from over 50 leading authors working at institutions around the world, the volumes seven sections provide a systematic overview of neoliberalisms origins, political implications, social tensions, knowledge productions, spaces, natures and environments, and aftermaths in addressing ongoing and emerging debates. The volume aims to provide the first comprehensive overview of the field and to advance the established and emergent debates in a field that has grown exponentially over the past two decades, coinciding with the meteoric rise of neoliberalism as a hegemonic ideology, state form, policy and program, and governmentality. It includes a substantive introductory chapter and will serve as an invaluable resource for undergraduates, graduate students, and professional scholars alike. No comments for "[PDF] The Handbook of Neoliberalism (Routledge International Handbooks)".